As WordPress developers, we often encounter projects that need to include previously attained data, whether that be from simple text files, CSV files, or even an old database. Data migration is something any back end developer will encounter. A few months back, we had a project that needed nearly 1,000 posts to be generated from a plethora of CSV files. Now, usually this wouldn’t be that hard but this data also needed to be under its own post type and that custom post type had a few custom fields, including a media attachment for an MP3 file. I won’t bore you with the code for creating custom post types and custom fields, because there’s already a ton of articles floating around the web on that subject. 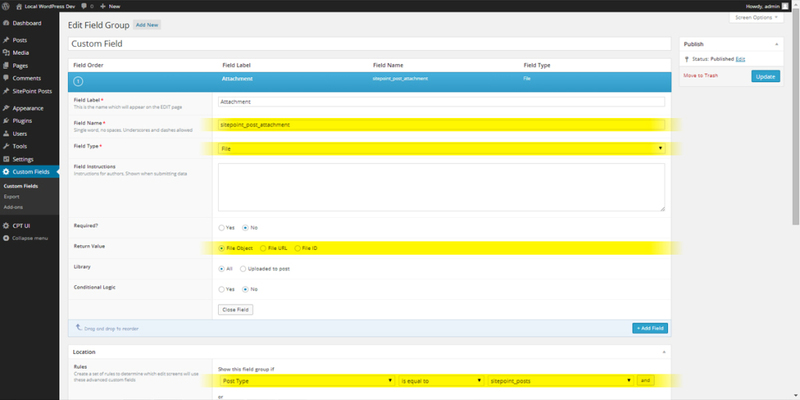 I’ll just mention that I am using Custom Post Type UI and Advanced Custom Fields for each respective task. As the title suggests, what we’re going to be covering here is programmatically taking data from a bunch of CSV files (some containing multiple posts), and then turning that data into WordPress posts for a custom post type. We’ll even go over attaching a simple text file to each post. In order to get all the data we need from the CSV files, we’ll be making use of a few nifty PHP functions, such as: glob(), which ‘globs’ a directory and returns an array of filenames within it; fopen(), which opens up a file so that we can read its contents and finally, fgetcsv(), which parses a CSV file into a nice associative array housing all our data. In reality, most of the data we’ll be using for this article would probably be inside of a single CSV, as opposed to how we’re going to be doing it today where the data is scattered throughout multiple files. This is done so that the techniques used here can be implemented using other types of data, such as JSON, Yaml, or even plain text files. The idea for this whole article came from the severe lack of tutorials and articles concerning this subject, especially when you’re using custom post types and custom fields. If you want to follow along, you can grab the needed CSV files (and all of the code used in this article, too) from this repo. Alrighty, first things first, let’s take a look at the CSV data we’re going to be dealing with (please note the ‘File’ column is there to show you that I am spreading all of this data across multiple CSV files). Lastly, let’s take a look at the custom field we’ll be using. It’s created with the lovely Advanced Custom Fields. Here’s another quick screenshot of the settings we’ll be using. Please note, the ID for your custom field will likely be different from the one used in this article, so be sure to update your $sitepoint array with the correct ID. This can either be the actual hash key for the field, or simply the name of the field. I’m just going to stick to the name, for the sake of clarity. It’s worth mentioning that the code used in this article requires at least PHP 5.3. We’ll be making use of anonymous functions, as well as fgetcsv(), both of which require 5.3, so before you go off and use this on an old rickety production server (please, don’t do that), you might want to upgrade. Another thing to mention is that I’m not going to get into PHP’s max_execution_time, which can cause some issues when inserting a large amount of posts in one go. The setting varies so much from server to server that it’s not feasible to discuss it in this article. If you’d like to learn more, there’s a ton of information on Stack Overflow, as well as on the official PHP docs on how to go about increasing your max execution time. 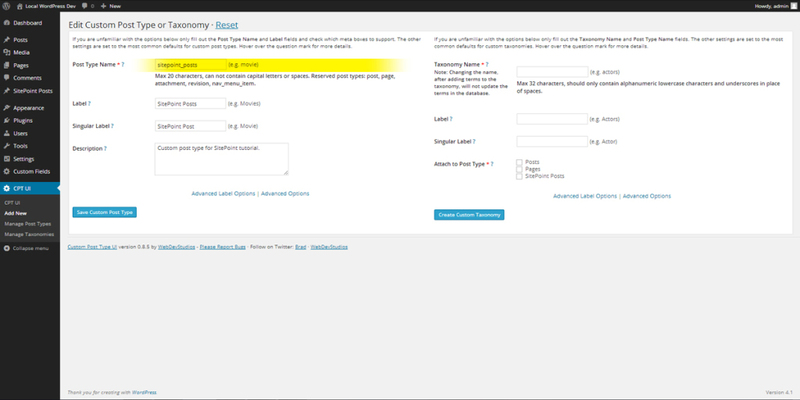 To start this off, let’s create a simple button that executes our script within the back-end of our site. This will ensure that our code is only executed by us, the administrator. To do that, we’ll just make use of WordPress’ admin_notices hook. Basically, all it’s going to be doing is creating a $_POST variable that we’ll use to determine whether or not we should insert the posts into the database. If you want to put all of this code into your functions.php file, that’s fine, though it’s also fine if you want to create a separate page template, a hidden page, or whatever. In the end, it really doesn’t matter. To start out, let’s use another WordPress hook, admin_init. We’ll also include the $wpdb global, so that we can do a custom database query later on. Alright, so what next? Let’s start out by checking whether or not our $_POST variable is present, and if it isn’t, we can exit the function. No use in wasting memory on nothing. To check whether our variable is present, we’ll use the $_GET variable. If you’re not familiar with these types of variables, you can read up on them here. In addition to the above check, we’ll also define our $sitepoint array that I mentioned earlier. 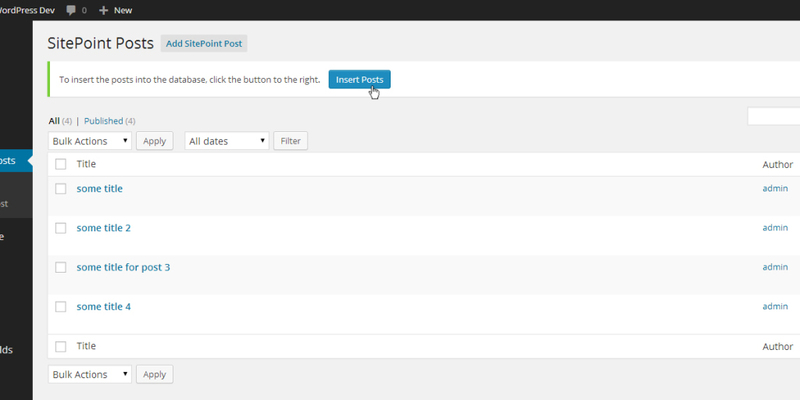 It will contain your custom post type and custom field ID’s. It’s worth noting, that anytime I use // ... within the code of this article, that is a continuation of the last code block we covered. Most of the code in this article is within the closure for the admin_init action we just created above. At end of the article, I’ll supply you with the full code, so don’t worry if you get a little lost. //  the post creation _only_ happens when you want it to. Next, let’s create a closure that will fetch our CSV data and create a nice associative array of all of the data. Now, it would be good to note that depending on what type of data you’re using (whether that be CSV, JSON, Yaml, etc. ), this closure will vary. So, I would suggest that you adjust this to fit your data. I’ve commented the code below so that you can better follow what is actually going on. * The $array = "value" syntax is short for array_push, which pushes the assigned value onto the end of the array. * I’m storing my CSV data within my theme, inside of a data/ directory. You can store it wherever you want, but just remember to adjust the glob() path to whatever you choose. // Get the data from all those CSVs! It might not seem like a lot, but it’s enough to get the job done. Next, we need a function that can check whether or not our post is already in the database. Nothing is worse than executing a script that inserts hundreds of posts, only to realize it inserted everything twice. This nifty little closure will query the database, and make sure that doesn’t happen. In this closure, we’re going to be using the use() function that allows us to access variables outside of the scope of the closure. //  database. This isn't very efficient, but it works. You’re probably wondering when we’re actually going to insert all of this data as actual posts, huh? Well, as you can tell, a lot of work has to be put into making sure that all of this data is organized cleanly, and that we have the functions set up to do the checks we need. To get this going, we’ll execute our $post() closure, so that we can loop over the data that gets returned. Next, we’ll execute our $post_exists() closure to see if the current post title exists. So, within the code below, there’s a lot of arrays and data being passed around. I went ahead and commented the code so that you can better understand everything. Basically, we’re inserting the post into the database with wp_insert_post, and saving the returned post ID for use later on. Then, we grab the uploads directory and create the needed attachment meta data by creating the path to the uploaded file (which is in uploads/sitepoint-attachments); and then finally grabbing the file’s name and extension, which we’ll use to insert the attachment into our newly created post. Programmatically inserting WordPress posts from CSV data isn’t as hard as we initially think. Hopefully, this can act as a resource for a lot of people when they need to migrate data that uses both custom post types and custom fields. Like I stated in the beginning of the article, a lot of the code, such as our backend button using $_POST variables, shouldn’t be used in a production site. The code used in this article should be used as a starting point, rather than a plug-and-play solution. I hope you enjoyed the article. If you have any questions or comments, feel free to leave them below and I’ll try my best to answer them and troubleshoot any issues that you run into. Happy coding! Ezekiel 'Zeke' Gabrielse is a full-stack developer and designer currently based in North Texas. He loves open source, adventure and a good, challenging project to work on. Check him out on GitHub, Twitter and his personal blog.